BC Khimki Moscow Region improved to 2-2 in competitive Group A by topping Union Olimpija Ljubljana 75-65 at home on Friday. 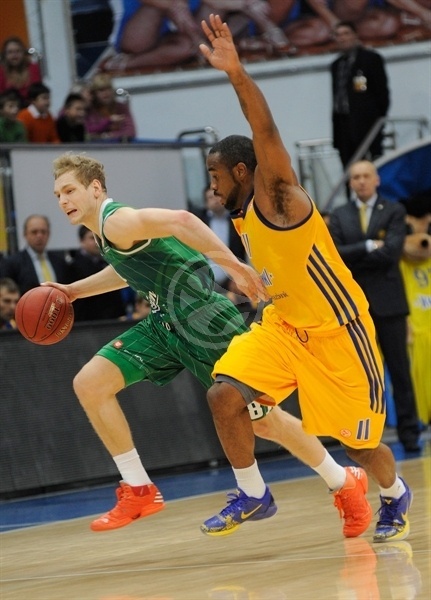 Khimki improved to 2-2 and stayed undefeated at home and is tied for third place Panathinaikos Athens. Olimpija suffered its third consecutive defeat for a 1-3 record but is tied for fifth place with Mapooro Cantu as it looks forward to playing its next two games at home in Stozice Arena. 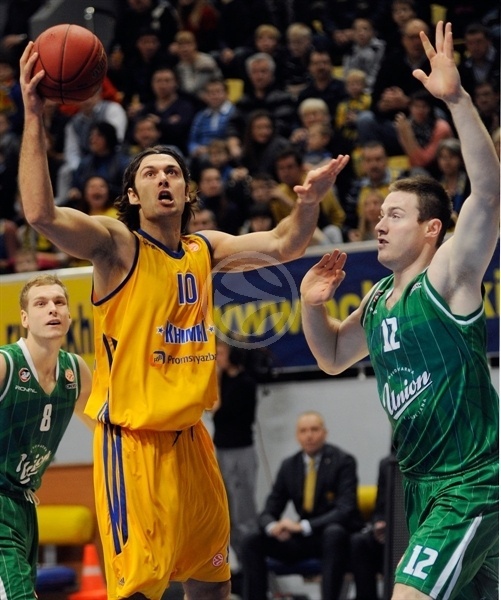 Vitaliy Fridzon led the winners with 20 points. K.C. Rivers added 16 while Sergey Monya had 10 for Khimki. 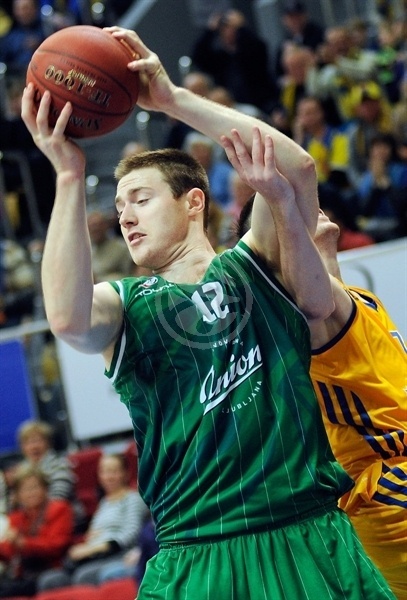 Aron Baynes led Olimpija with 27 points on 10-of-12 two-point shooting and 10 rebounds. Dylan Page and Sasu Salin each added 10 points for the guests. Baynes had 12 points in the first quarter to bring Olimpija an 18-19 edge. Baynes continued scoring, but once he went to the bench, Fridzon led a 13-0 run which allowed Khimki to take the lead for good. 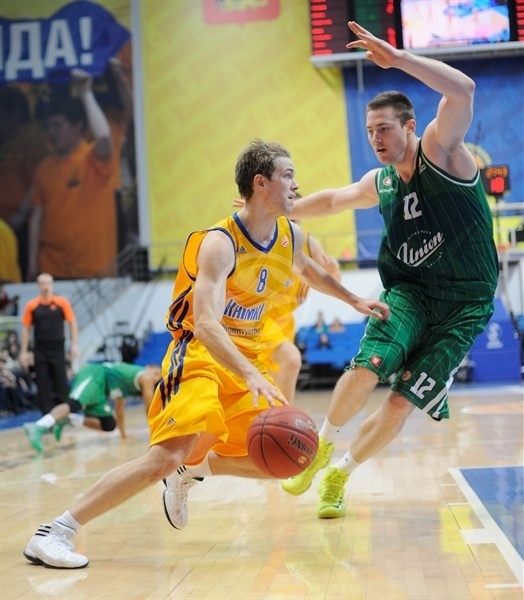 Khimki was up 43-33 at halftime and managed to lead 56-48 at the end of the third quarter. Olimpija kept trying but Fridzon and Rivers made sure that Khimki stayed out of trouble all the way until the final buzzer. Both teams struggled to score early until Baynes announced his arrival with a backdoor slam. Petteri Koponen quickly answered from downtown for a 3-2 Khimki lead. 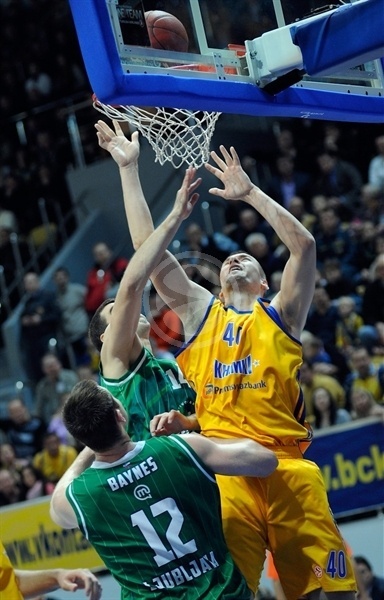 Baynes kept pacing Olimpija with an alley-oop layup that Zoran Planinic erased with a turnaround jumper in the lane. Page scored in penetration for Olimpija but Rivers matched that with a six-meter jumper for a 7-6 score. 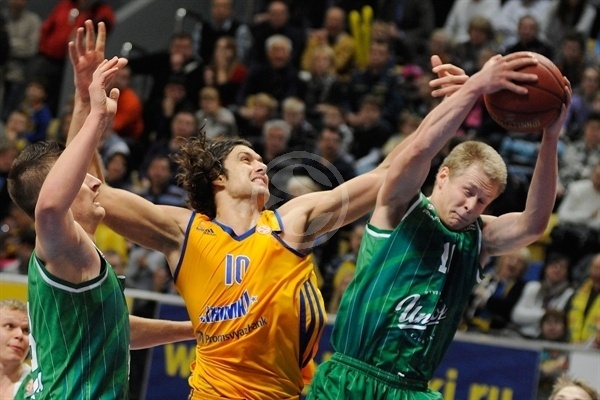 Salin sank a wide open three-pointer but free throws by Planinic tied it for Khimki at 9-9. Baynes add a jump hook in the lane that Fridzon answered with a backdoor layup for Khimki. Olimpija kept playing with patience in offense, trying to get Baynes involved as much as possible. He scored again but Fridzon tied it again at 13-13. 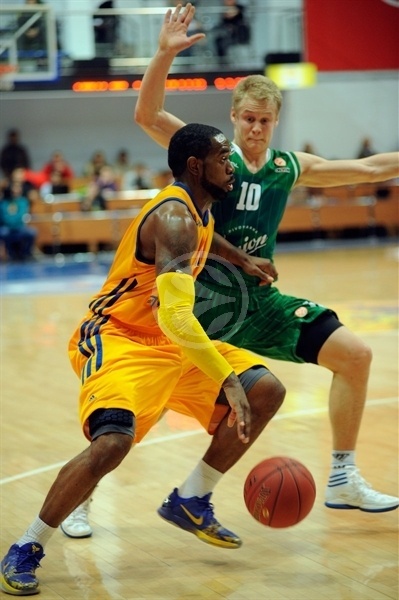 Baynes stayed unstoppable with a power layup that Rivers bettered with a triple to put Khimki back ahead, 16-15. Salin scored around basket and Baynes - who else? - added a put-back basket for a 16-19 Olimpija lead. A buzzer-beating jumper by Matt Nielsen fixed the score at 18-19 after 10 minutes. Rivers stepped up with a put-back basket early in the second quarter but Baynes stayed on fire and his first three-point play gave Olimpija a 20-22 edge. Paul Davis nailed his trademark turnaround jumper that Baynes matched from the baseline. Davis kept trying to change things for Khimki with a three-point play and Fridzon added a back-to-back three-pointers to give the hosts some fresh air, 31-24. Olimpija struggled to score without Baynes on the floor and Khimki kept running its offense through Fridzon, whose free throws made it a nine-point game, 33-24. Sergey Monya capped a 13-0 Khimki run with a fastbreak layup, as Alen Omic stepped up for Olimpija with a jump hook. Nielsen split free throws and Planinic added a layup off a steal for the first double-digit lead, 38-26, forcing an Olimpija timeout. Baynes returned to the floor and delivered with a jump hook and 1-of-2 foul shots before Page brought the guests within 38-31. However, Koponen made free throws and Fridzon buried another triple as Khimki restored the double-digit difference, 43-33, at halftime. Planinic made a put-back layup right after the break that Page answered from downtown for a 45-35 score. Fridzon scored in transition but Teemu Rannikko found his first points on a mid-range jumper and Jaka Blazic added free throws to get Olimpija a bit closer, 47-39. Loncar hit a jumper to join the Khimki scoring column. Rannikko hit free throws but he didn't find much help from is Olimpija mates as Loncar had managed to slow down Baynes. Loncar hit his own a baseline jumper but Page copied him at the other end to keep Olimpija within 51-43. Monya stepped up with a catch-and-shoot triple from the left wing for Khimki while Olimpija lacked a go-to scoring response, with floor with Baynes and Rannikko resting until Salin appeared with a seven-meter bomb. Rivers quickly answered with a put-back layup as Khimki held onto a 56-48 lead after 30 minutes. Rivers nailed a corner jumper early in the fourth quarter that Dino Muric matched it with a layup. Khimki used twin point guards Dimitriy Khvostov and Koponen on the court together to improve its ball circulation. Rivers sank another long jumper and soon added a three-pointer to make it a 12-point game, 63-51, with under 8 minutes to go. 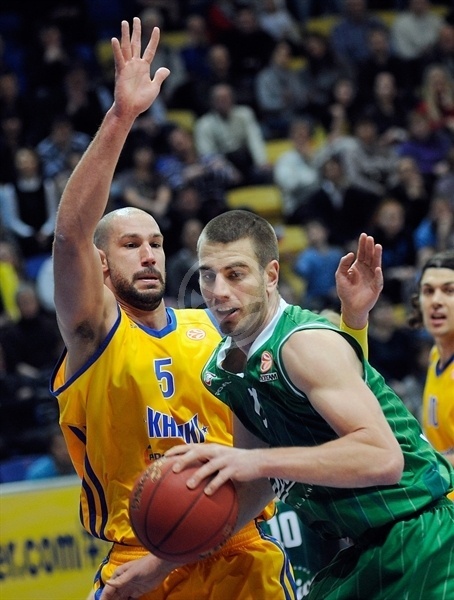 Blazic made 3-of-4 free throws and Omic dunked it to give Olimpija some hope at 63-56. Fridzon rescued the hosts with another three-pointer but that's when Baynes reappeared with a huge dunk and free throws to bring Olimpija as close as 66-60 with 4 minutes left. Soon, however, Monya buried a three-pointer to make it 69-60, forcing Olimpija to call timeout. That proved to be the shot that Olimpija could not come back from as a closing basket by Loncar let Khimki's fans to start celebrating at 71-60 as Olimpija could not rally in the last couple of minutes. "It was not an easy thing to play against Union Olimpija, it’s a team with character, but a victory is a victory. I’m happy with the win, but our game leaves much to be desired right now; we have a lot of things to be worked at. BC Khimki didn’t succeed in rebounding and didn’t play aggressively on defense. 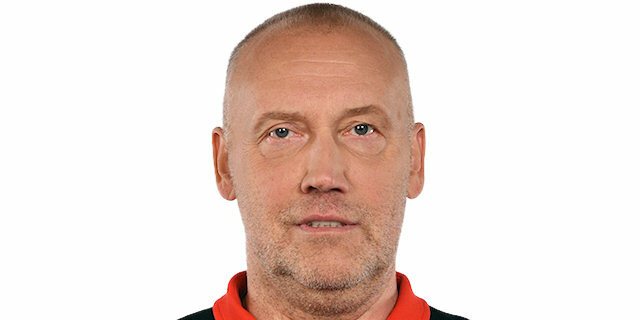 We had some problems with our centers: it looked like they played 60 games, but the season has just started." 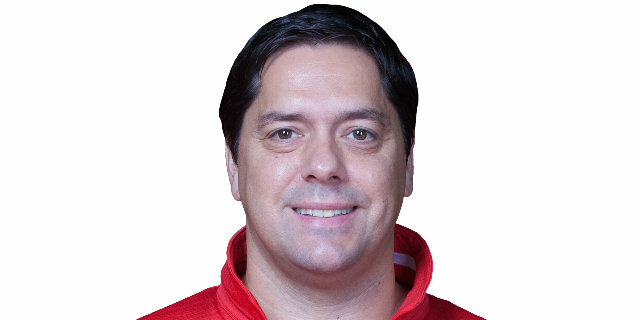 "I congratulate BC Khimki on the victory, today they were better. We played a good game, but didn’t score many open shots. In the first half, we could have played better on defense, but allowed our opponent to score easy points. We made many mistakes and turnovers. The key moment was in the end when BC Khimki had a 6-point lead and we had a chance to get out, but Sergey Monya made a three-pointer. Unfortunately we couldn’t make our shots." "The main point is our victory because in case of a defeat, the situation of our team would have been pitiable. We probably underestimated our opponent, especially big guy Aron Baynes – he scored 20 points only in the first half. He gave us a lot of trouble under the hoop and in rebounding. To cut a long story short, it’s great we won after two road defeats, the mood within the team has become better. Hopefully in the next games we will obtain only positive results." 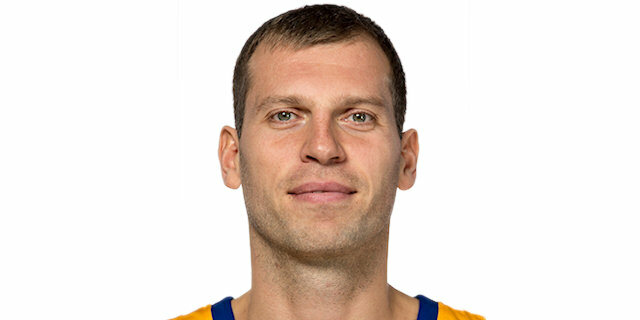 "I'm happy to be back to Khimki; I have great memories from this arena and its wonderful atmosphere. We knew that we had small chances to win this game, but we tried to play a perfect match and we did it. It was also nice to play against my friend Petteri Koponen. Wwe faced each other for two years during my stay in Italy. We are a very young team and nobody expects much from our performance in the Euroleague. Moreover our group is very tough; we managed to win first game in Cantu, but then suffered three defeats in a row. So we’ll try to improve."